Once upon a time, in what surely seems like a galaxy far far away to me now, Steve and I produced big events—many of them at the Strand nightclub on Rehoboth Avenue. Sundance grew out of that time period, but there were other huge parties along the way—and quite a few of them were July Fourth celebrations. One year about killed us. We did three separate parties on the three nights of the holiday weekend. Friday night was The Red Party, Saturday night was The White Party, and Sunday night was The Blue Party. Different décor each night—and back then, the Strand was open until dawn. By the time that last party ended we were more like black and blue. At some point in that same general time period we did a July Fourth Lavender Party. Lavender? Unorthodox to be sure, but obvious from the invitation—a multi-panel folding card that read from panel to panel in big block letters: Art 101, Red + White + Blue = Lavender. In popular culture through the decades, the color lavender has been associated with gay people. The Lavender Revolution was another name for the early gay liberation movement. Back in the 1920s lavender defined an effeminate style; by the 1950s and ’60s, lavender was a symbol of homosexuality. A Lavender marriage was the union of a man and a woman when one or both of them were gay. References abound: The Lavender Dragon (a gay bookstore), The Lavender Panthers (gay rights group in the ’70s), and lavender boys (an expression used in the ’60s). Finally, the combination of light blue for boys and pink for girls mixed up a lovely shade of…yes, lavender. As we celebrate Independence Day in 2018, “from sea to shining sea,” the good old USA is split right down the middle—conservative and liberal, red vs. blue. We could use some color mixing here. Aren’t we supposed to be the great melting pot? What we heard over and over again from all the Stonewall speakers was a call for action. Now is not the time to sit back and count our past successes as done deals. Throughout history, LGBTQ people—though they certainly weren’t called that—have helped to shape the culture of their time. The question is: what are we going to do right now? In the wake of Steve’s death, there was much written about the history of CAMP Rehoboth and the way that the organization went about integrating itself into the community around it. Our philosophy was not “in your face” activism; it was a steady and consistent demand for equality for all people. More than that, it was an absolute belief that we are all created equal, and that when we openly share who we are with our neighbors, we cease to be gay and straight and become simply neighbors—people living side by side and trying to make the best of life in a world that seems broken to us. Though I will leave its lineage to the historians, the road to the extreme partisan politics we have today has been under construction for decades. We can easily see how it has been pumped into overdrive in recent years: the relentless bashing of the press, the devaluing of truth, the constant fearmongering about people who look and act and believe differently from ourselves. We are stuck fast in silos of like-minded people, and we cannot find the exit door. At some point we have to break free. We have to find ways to talk to people who are not like us. Most of all we need strong leaders who will guide us out of this mess, and mix us up, neighbor to neighbor, American to American. I can’t remember the exact words of Senator Carper, but his meaning was clear. Good leaders inspire the people, speak the truth, and accept responsibility for their actions. We have to fight for that diversity—not just for the children at our borders—but for the soul of our country. It is easy to become disillusioned by the lies, the deliberate attempts to divide us as a nation, and the careless scapegoating of minority communities for political gain. We cannot. 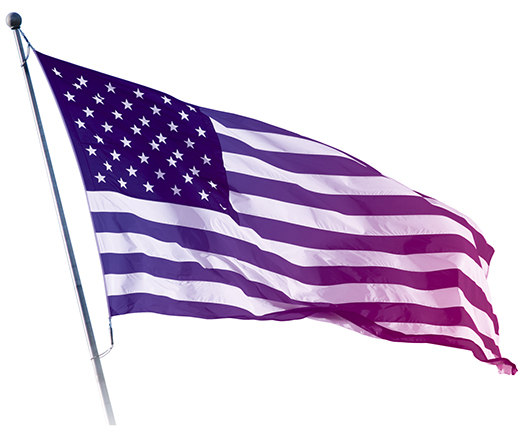 Are we motivated enough to dye our American flags purple this year? Are we motivated enough to carry the CAMP Rehoboth philosophy of room for all into communities where we are not welcome? Every morning I walk my dog Pete up and down Rehoboth Avenue. Even with the personal pain that I carry in my heart after Steve’s death, I find joy in that walk, and in this place where we live. We have worked for equality and freedom here. I feel safe here—and valued. This is home. I hope that as a part of our 2018 CAMP Rehoboth strategic planning process we will debate that question—and find ways to carry the “house and heart” into communities far beyond the safety and comfort of this one. One thing I know for sure, we don’t change minds with confrontation—only with love and respect for each and every person and their beliefs and opinions, no matter how different they are from our own. Time for a little color mixing, I do believe. Maybe purple stars and lavender stripes—with a few pansies thrown on for good measure.